As Arianna Huffington writes in her book Thrive, “the ever-increasing creep of technology—into our lives, our families, our bedrooms, our brains—make it much harder to renew ourselves.” That’s why we’ve created The Phone Bed, the world’s first family bed for our digital devices. Think about it: at bedtime, you turn off the TV, you close the blinds, you lock the door, you tuck in your kids (if you have kids), you get in bed—and then proceed to spend an hour answering emails and checking social media. Taking our phones to bed with us isn’t just a sad commentary on our relationship with technology—it’s also harming our sleep. Our screens emit blue light—which inhibits the secretion of melatonin, a hormone that influences circadian rhythms—making it harder for us to fall asleep. It’s long past time to set some boundaries with our devices, and you can start by charging your phone outside your bedroom. The Phone Bed makes it a bedtime ritual for the whole family—you can even tuck in your devices with a soft satin blanket. 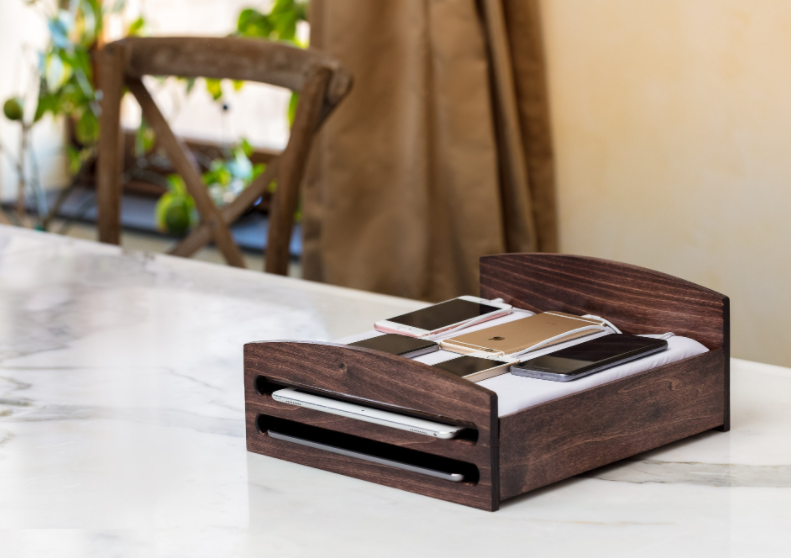 The Phone Bed is available for $100 at the Thrive Global store, which is stocked with products and technology that foster well-being and productivity. It functions as a communal charging station, and with space for up to 10 devices at once, it creates a screen-free sleep space for the entire family.